* If you have friends with healthy, well-socialized dogs that like or tolerate puppies, make play dates with them. The more positive experiences with other dogs, the better. * Think of places you can bring dogs – garden supply nurseries, some hardware stores, restaurants with patios, etc. 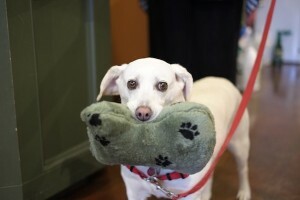 On our street, Beaumont Hardware and Umpqua Bank are two places that welcome dogs (and they have treats). The Fremont Commons Building at 46th and Fremont has an elevator that sometimes works – take your puppy for a ride to expose them to a new experience. Brainstorm for things like this to show your puppy experiences that they might encounter later in life, and work to make that a positive experience. Make a point to meet children, men with beards, people in wheelchairs, walk on different surfaces, etc. 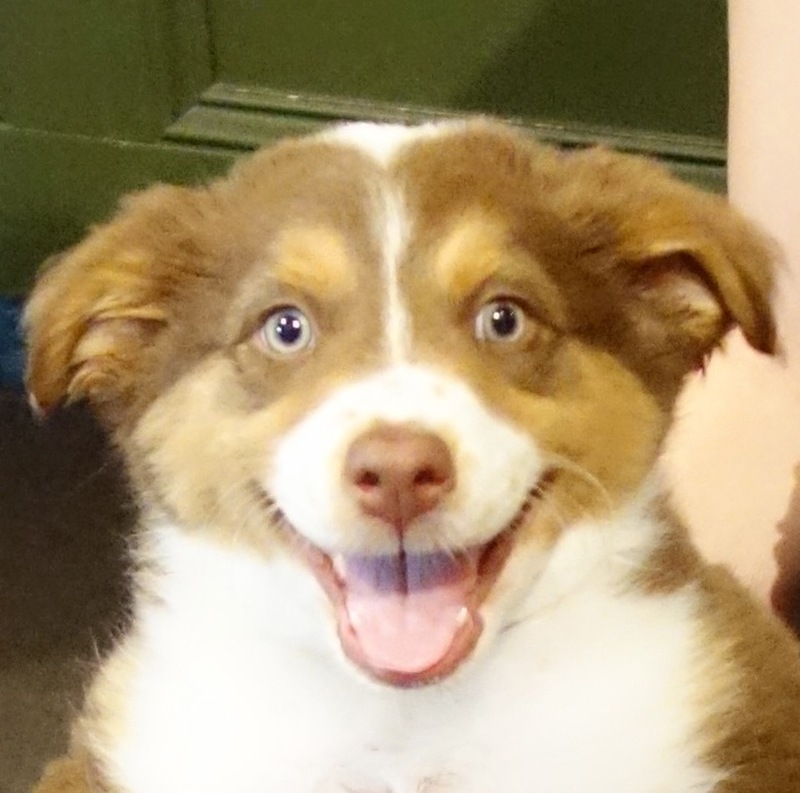 Don’t forget, you are welcome to bring your puppy as often as you like to Green Dog just for the socialization. 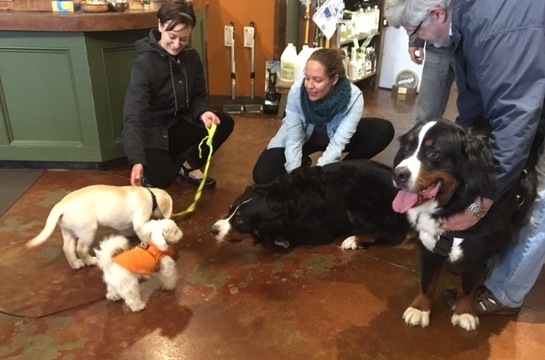 We often know the other dogs that might be in the store and which of them are good with puppies, and of course there will be lots of nice people to meet. We don’t expect you to buy things – we’re just happy you’re working on socializing your pup and we’re happy to help you if they’re nervous. * If there are things in the world that are a little scary, use your happy jolly voice to tell them all is OK. You might say, “Wasn’t that a big funny dump truck!” instead of acting very concerned, as they’ll pick up on your mood and body language. * Treats can go a long way to making a dog less fearful of strange new people. Pairing something yummy with something that’s a little scary truly works well to convince a dog that that thing or person will not be harmful to them. Asking people to bend their knees also makes them less intimidating than when they loom over them. It also allows the puppy to approach the stranger and retreat a little if they need to as they build confidence. They can even toss a frightened pup a tasty treat – the puppy will be more likely to approach a person after they see something good comes from them. Don’t force them into interacting with something that’s scary, just cheerlead them into it with a happy encouraging voice as they make progress. * If a puppy is nervous about approaching an exuberant dog, have the owner hold that goofy dog in one place and allow the puppy to approach and retreat and build confidence that way. This will help them not to be overwhelmed by the experience. As they approach, cheer them on and tell them they’re great! It helps! * Avoid dog parks in the early months. Public parks carry a greater risk of interacting with a sick dog or their excrement, and many dogs that aren’t well socialized are brought to parks by misguided owners that think it will help their poorly socialized dogs. Even being greeted by a group of well socialized, excited dogs can be very intimidating for a young puppy, making them less likely to want to interact with strange dogs in the future. Try and stick to cleaner environments with a stronger likelihood of good experiences with other dogs, like puppy socialization groups. * If your puppy is meeting another dog on a leash, ask the owners if their dog likes puppies and then keep their leashes slack so that you’re not unintentionally giving your puppy a warning signal that it’s not safe to meet. Keep on-leash meetings with strange dogs fairly short to make sure they stay positive. We are lucky to live in a time and in a town that has a tremendous selection of ways to nourish your puppy. 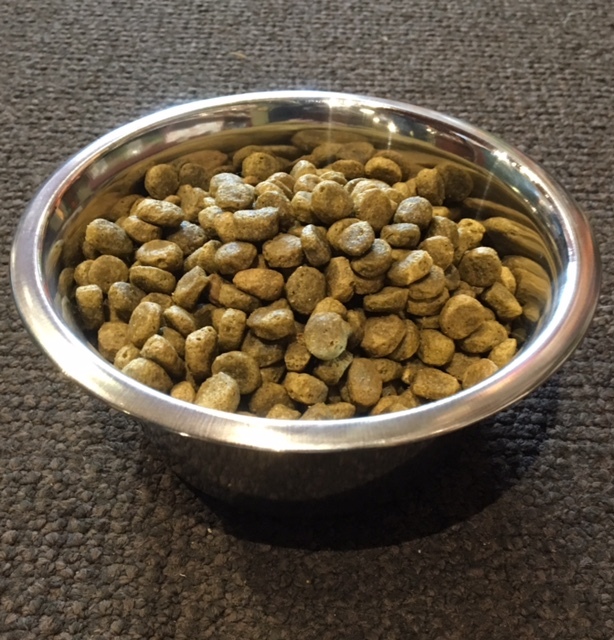 Most people automatically pick up a kibble for their new dog, but we’d like to let you know that there are other options as well. 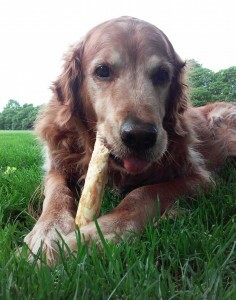 Food is the absolute cornerstone of health, for us and for our dogs. Many foods will allow your dog to survive, but the quality of the ingredients and the amount of processing a food goes through can help deliver the nutrition needed to truly thrive. In our opinion, kibble has come a long way in the past 10 years or so and some brands have made great strides towards supporting health with quality ingredients. However, it is helpful to understand that kibble is still a highly processed form of food. Many people realize that for our own health the fewer processed foods we consume and the more whole foods, the better. We realize that not everyone has the time or inclination to prepare their dog’s diet at home using fresh meats and veggies, (though if you want to, we’ll give you good resources so that you can make sure it’s balanced), but any amount of whole foods in the diet are a good step in the right direction. (When foods are cooked, vitamins and nutrients are damaged, proteins become less digestible, and valuable enzymes and important amino acids are destroyed. While some may be supplemented back in with synthetic versions, many are just lost.) Remember, AAFCO guidelines (AAFCO is the organization that makes the rules about what is required in pet food) represent the minimum standards to sustain life and body weight, but not necessarily more than that, and have no guidelines as to the quality or bioavailability of the ingredients. (“Bioavailability” refers to ingredients that are the most digestible and nutritious for the species you’re feeding). The rates of cancer, obesity, allergies, and other chronic illnesses in our pets these days is astounding, and we feel that a lifetime of processed food can play a role in the development of many chronic conditions. Other kinds of foods that we carry offer interesting, safe and convenient ways to provide whole food nutrition as some or all of your dog’s diet. These include dehydrated or freeze dried stews that you reconstitute with water and commercially prepared balanced raw food meals in the freezers. Over and over we see chronic health issues improved or resolved with a diet made from whole, minimally processed foods, so it stands to reason that these diets could have prevented these problems to begin with, extending lives and saving tons of money at the vet. Note:These types of foods don’t have to be an all or nothing proposition! Some people feed kibble in the morning and whole food at night, or they have one or two days a week that are kibble-free, or some even add a nugget of frozen raw to their dog’s dinner as a little whole food supplement. For example, a 3# bag contains 48 frozen nuggets and costs something like $16.99 – that’s cheaper than any synthetic vitamin supplement on the market! That being said, we know that kibbles are convenient, and we’ve tried to stock the very best kibbles on the market, made with human grade ingredients and safe manufacturing processes. Some even have some freeze dried raw ingredients applied after cooking, or are made without the use of synthetic vitamins and minerals. * Avoid by-products and any meats or fats that don’t specify the species used. For example, you want it to say something like“Chicken Meal” or “Herring Oil” and not “Meat and Bone Meal” or “Animal Fat”. These are the ugliest ingredients in the pet food industry, by far. * Avoid artificial colors (ie: yellow #5) and chemical preservatives (ie: BHA and BHT, banned in other countries for their carcinogenic properties). * Avoid extremely grain-heavy foods, especially those with wheat, corn, and soy. Not only are these allergenic for many dogs, but they are a less expensive source of protein than higher quality meat proteins which are necessary for dogs to thrive. Grains like corn are very high glycemic and prone to dangerous, toxic grain molds like aflatoxin. Corn, soy, and beet pulp are likely to be GMO, so potentially could have pesticide residues. High carb foods can put weight on your dog, and grains are high in phytic acid, which inhibits mineral absorption, possibly causing tooth and bone problems. * Rotate your foods. Don’t get in a rut where you feed the same brand and flavor for years and years. Think about it this way: no matter how much thought and care we might put into it, we couldn’t create a single plate of food for ourselves that would provide every nutrient we could possibly need, so that we could eat it for every meal of every day of our lives. It makes sense that doing this might eventually create a deficiency in something we need, or a nutritional excess in something that we’re eating that isn’t well suited to us. Each protein has a unique combination of amino acids, and each brand of food has chosen a different mix of fruits, veggies, fats, etc. 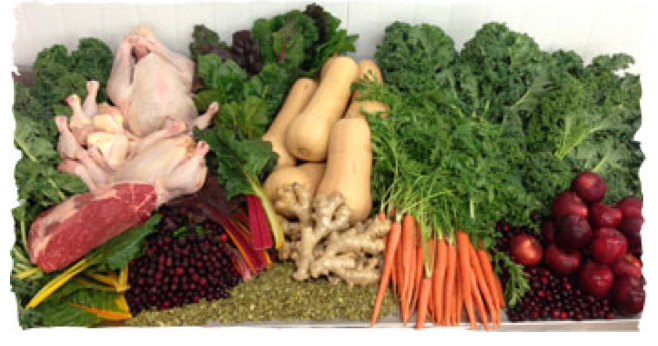 Rotating foods allows for a greater variety and balance of nutrients over time. We also see dogs that have developed an intolerance to certain proteins from eating the same one for many years – their bodies just start to reject it, reacting to it as if it’s an allergen. Occasionally rotating to different proteins helps to prevent this, and occasionally rotating brands allows you to provide a wider variety of nutrients. Dogs that never rotate are the ones that have the most difficulty (digestively) changing foods, so occasional rotation helps to avoid this. (Always blend the new food slowly into the old food when you switch to avoid digestive upset). Rotation also allows you to observe changes in your dog’s appearance and vitality as you try a new protein or a new formula – every dog is different, and trying new things allows you to see what suits your individual dog. Some vets worry that people who change foods a lot won’t be able to identify what might be causing a problem for your dog if he has one, and for this reason we encourage you to make one change at a time, blend between old food and new, and stay on a new formula for a few bags to make sure it suits your dog before introducing a new one. Always return something that isn’t working for your dog. Some brands have frequent buyer cards (with a free bag after 10 or 12 bags) which can also be useful to help you to track what you’ve been feeding and how long it takes you to go through a bag. Some customers rotate flavors within a brand and then use the free bag they get at the end of a card as the reminder to start blending it with a new brand next time. * If you think there is any chance that there is something wrong with a food you are feeding, always report it to the company and also to the store you bought it from. Always keep the packaging for a few days on any food, so that if you need to report it, the lot # will be available. This can help to protect other dogs from safety problems as well as helping the store to notice patterns in returns that could indicate safety or manufacturing problems. A bag of kibble might have pretty pictures, but do you know what’s inside? * Myth – Kibble cleans teeth – First, cats and dogs are carnivores; their teeth are not designed for chewing or grinding like ours are, they’re designed to shear through meat, bone and organs like scissors. The best they’ll do is crack a kibble and swallow it, which does not clean the teeth. Even though we humans have teeth that chew and grind, really crunchy human foods don’t clean our teeth either, actually. The starches in kibbles can adhere to the teeth and cause tartar, and the best way to clean them is with chews (see below) and brushing. Raw food, on the other hand contains enzymes that help to control bacteria in the mouth, and doesn’t adhere to the teeth as much as kibbles and canned foods do. * Myth – You should never change your dog’s food – (see discussion of rotation above). * Myth – You should never feed your dog “human food”– True, some foods like Twinkies and Doritos would be inappropriate to feed your dog, but things like cooked chicken, sweet potatoes, and green beans are just better whole food versions of things that are already used in pet foods, and nothing magical happens to these ingredients when made into pet foods to make them more appropriate for dogs. There of course could be behavioral problems that can occur if people are feeding these foods from the table or rewarding begging, but nutritionally speaking, whole foods make great training treats and food toppers. Notes: when adding whole foods to a balanced diet, they shouldn’t make up more than 20% of the total amount fed without needing to discuss how to make them more balanced, and one should always consider portion sizes/calories when any additions are made. A good resource: www.dogaware.com is a great site for advice on home prepared diets and feeding dogs with specific health problems. “Discuss what kinds of vaccines your pet needs, and how often, with your veterinarian. I strongly encourage you to seek out a holistic vet to care for your pet, and especially when it comes to vaccinations. “If you can’t locate a holistic vet in your area, make sure not to take your pet to any veterinary practice that promotes annual or more frequent re-vaccinations, or sells “puppy packages,” where you get all the vaccines at once for a “bargain price.” And don’t use any boarding facility, groomer, training facility or other animal service that requires you to vaccinate your pet more than necessary. “At my clinic, Natural Pet Animal Hospital, we tailor make all vaccine protocols to minimize risk and maximize protection, taking into account the breed, background (was the pup orphaned, etc. ), nutritional status and overall vitality. Most of the time, with healthy animals, we follow the protocol of providing a single parvo and distemper vaccine at or before 12 weeks of age, and a set after 14 weeks of age. 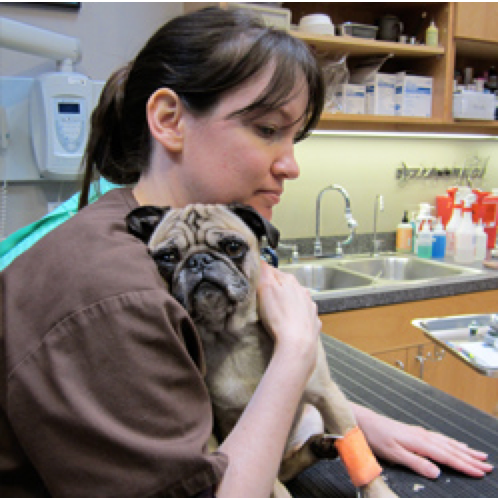 We titer pets 2 weeks after the last vaccine and if they have been successfully immunized, they are protected for life. “We do not use or recommend combination vaccines (six to eight viruses in one shot), which is the traditional yearly booster. When deciding whether to revaccinate, consider a Vaccine Titer Test. This test will help you and the doctor determine whether your pet has adequate immunological protection from previous vaccinations. Should the titer tests indicate vaccine levels are low, we recommend a booster for only the specific virus or viruses that titered low. Hence the importance of working with a holistic vet that carries single vaccines”. When feeding a quality diet, you generally will have little need for supplements, but there are a few things that help to maintain good health, especially for puppies. *Probiotics and digestive enzymes: Just like in humans, 70% or so of a dog’s immune system is generated in the lining of the gut. The good bacteria in the gut does a lot of work, including fighting bad bacterias and yeasts. Enzymes (normally found in fresh foods but are destroyed by cooking) help to break down foods into the nutrients their bodies need. The good flora in the gut is easily damaged by antibiotics, steroids, over vaccination, toxins in our environment, stress, etc. Supplementing with probiotics is important to support healthy gut function and a strong immune system. This is especially important for puppies – they’re encountering many stresses and challenges to their immature immune system with vaccines, exposure to the new world, and the normal stresses of their world changing for them so drastically from baby to adolescent. *Omega 3s – Fatty acids like those found in fish oil provide many benefits to the body. They not only support the maintenance of healthy skin and coat, but studies show that puppies fed a diet higher in DHA (found in fish oils) improved cognitive, memory, psychomotor (movement, coordination and dexterity), immunologic and retinal (vision) functions in growing dogs. 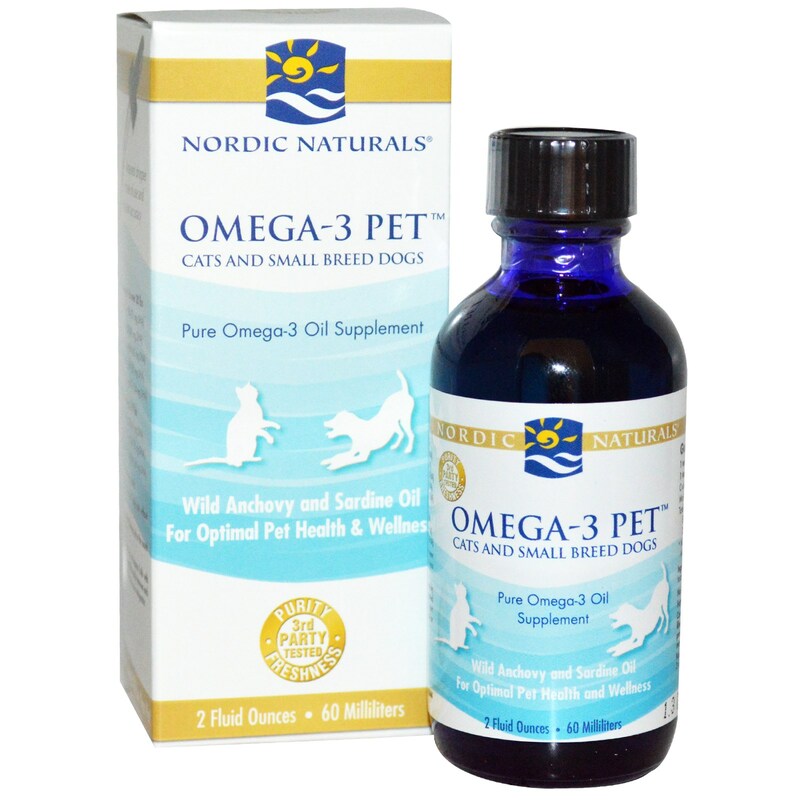 As dogs age, these fatty acids also help to fight inflammation in the body and support joint health. A good rule of thumb with all supplements is to always only introduce one new thing into a dog’s life at a time, at a smaller dose than is recommended on the label. Your dog might be one of the rare dogs that has a problem with a specific ingredient, and you can’t “un-give” something if they start to show a sensitivity to it. Introducing every new thing slowly and building up to the recommended dose prevents digestive surprises as well. All puppies need to chew, and throughout a dog’s lifetime, chewing remains an important activity for both physical and behavioral reasons. Chewing helps to keep teeth and gums healthy and clean, which is critical in maintaining overall health. It is also a form of exercise that comes in handy on bad weather days to keep boredom at bay and relax a hyper dog. We have come to realize that all forms of chews for dogs have some kind of benefit, and they all carry some type of risk. Risks depend on not only the quality of the chew, but also the dog’s chewing style. All hard chews are more durable, long lasting and less likely to be choking hazards, but do carry the risk of a weak tooth breaking if a dog is trying to break the chew instead of just gnawing it. Senior dogs are even more at risk of breaking a tooth. Chews that soften as they chew and are ingested as they go (like bully sticks and tendons) are very beneficial for gum health (as they soften and get in between the teeth) but carry the risk of choking and in some cases (like rawhides) impaction if they were to swallow too much at one time. The general rule of thumb is that you need to watch puppies with every new thing that you give them, and realize that they’ll become more proficient at destroying things as they get older. Throughout a dog’s life, it’s important to supervise them the first few times they get a new kind of chew. Once you feel comfortable that they’re handling the new item well, then you can make the judgement call to leave them alone with it. * Kong – the Kong is an institution for a reason – these toys are generally very durable, safe to leave alone with a dog, and economical, as they can be filled with things from your kitchen. They are the best option for senior dogs or dogs who have had previous tooth damage. Kongs can be be frozen (and cleaned on the top shelf of a dishwasher), so if you’re creative, they can be a very valuable tool to keep dogs busy. Kongs should be big enough for them to fit their tongue inside. Start with foods or treats that fall out easily, and then graduate to smearing a little bit of peanut butter (without extra sugar or salt), a small amount of cream cheese, or canned dog food on the inside walls. Big cookies can also be crammed inside. Once they are emptying Kongs easily, start using your freezer. Many moist things can be frozen – plain yogurt with a few slices of banana, canned pumpkin, cooked sweet potatoes, canned dog foods, applesauce without extra sugar, etc. You might even prepare one the night before with a portion of their breakfast meal mixed with a little something else from the list above and freeze it. The rest of their breakfast can be fed as usual, but the portion in the Kong could be left with them on your way out the door. Fun hint for summertime: plug the small hole with a little piece of cheese, put the Kong upside down in a cup and fill the Kong with chicken broth. Freeze and give as a popsicle outdoors. * Bully sticks – Bully sticks are natural beef chew sticks that are like a thick tendon that softens and is eaten as they are chewed. They are valuable because they are so much more digestible (safer) than rawhides when swallowed, they soften and get between teeth like floss so help to keep gums and teeth healthy, and they are apparently super delicious, so they hold a dog’s attention. They can get a little stringy, and you probably don’t want them to swallow a big piece at the end of the stick, so we recommend using bully sticks and other tendons while you’re with your puppy, perhaps while you want them to relax while you watch a movie. You can even hold one end while they work on the other. Some bullies are stinky and some are not, depending on the store’s standards for sourcing. * Raw Meaty Bones – Raw meaty bones from our freezers can keep a dog very busy for a long time, can have nutritional benefits, and are very effective at cleaning teeth. Enzymes from the raw meat help to break down bacteria in the mouth, and the bones help to scrape it away. Raw bones are generally not as hard as smoked bones and so are less likely to splinter or to break teeth, though teeth can be broken on any hard chews if the dog is prone to trying to break it instead of gnawing it. 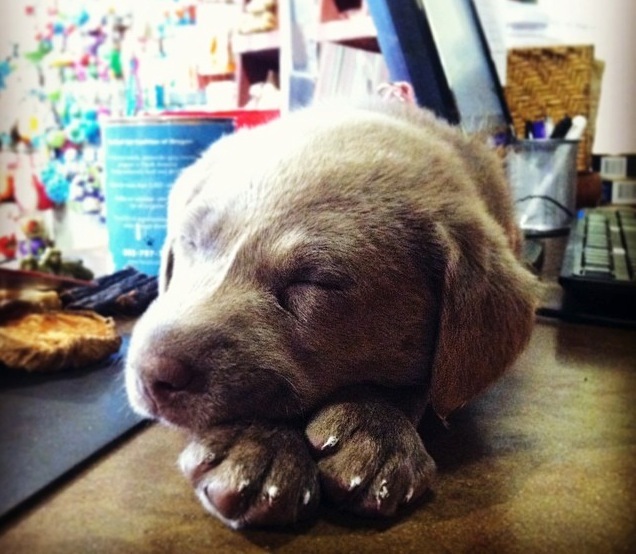 Starting puppies earlier on raw bones gives them more experience with how to handle them. As a rule, recreational bones are best if they’re bigger – ideally for safety it would be a knuckle the size of their head, as they’d be less likely to be able to fit it between their back teeth (though those are hard to find!). Marrow bones aren’t as messy as you think they might be, but some owners teach their dogs to chew bones on a blanket or towel by making a rule that if they leave the blanket, they lose the bone. Marrow can be a little rich at first, so you can either thaw one and give it to your dog for 15 or so minutes and then put it back in the fridge for the next day, or you can scoop some of the marrow out at first until you know they do well with it. Safety tip – take away marrow bones after they’ve cleaned off the meaty bits and finished the marrow, so they don’t try to work on breaking the bone. * Chicken necks, duck necks, and turkey necks can be very good teeth cleaning chews as well. Though they don’t last as long as a marrow bone, they are safer for the teeth and are packed with nutritional benefit. It is true that cooked poultry bones can be very dangerous, but raw poultry necks have lots of collagen/cartilage and more pliable bones than weight bearing bones. NEVER FEED HOME COOKED BONES OF ANY KIND – THEY COULD BE SPLINTERY AND DANGEROUS! (Slow smoked bones in pet stores are less likely to splinter than home cooked bones, but they do become extra hard when cooked). Another healthy benefit: feeding 3 necks a week is an effective joint supplement! Check the Green Dog Blog for a post called, “Chicken Necks for Cats and Dogs” for videos of both a cat and a dog eating necks and for more tips and info. *Antlers: Antlers are interesting – they’re fairly sustainable, as they’re naturally shed every year and they regrow. Even people who are vegan that have trouble with the concept of animal chews can rest easy with these as the animals are unharmed. They don’t stink or stain the carpet, and they’re less likely to splinter than bone. They also won’t be consuming anything that would stimulate their need to potty (like a full Kong might) and as long as an appropriate size is chosen, they won’t be able to choke on or swallow one, so we feel these make safe appropriate chews to leave alone with a puppy in a crate. They’re an animal product, so they are very interesting and hold their attention much better than something like a Nylabone. They’re also a great value, as they last such a very long time compared to any other chew. Though this is another hard chew, we’ve sold thousands of antlers in the last 10 years and have had only 2 or 3 reports of cracked teeth, though any hard chew like this can carry a risk of fracturing a tooth if they try to break it. Please note: “Split” antlers are more likely to cause slab fractures of the teeth than whole antlers, so strong chewers should avoid these. Choose the largest size you can to help to minimize this risk and watch them to see what their chewing style is like. When gnawed, they wear away slowly and should be discarded when small enough to be swallowed. * West Paw Zogoflex toys: These USA made rubber toys are far more durable than any other we’ve found – they often stand up to dogs that can chew up Kongs. These might be a good option for senior dogs or dogs with previous tooth damage. They come in fun shapes – especially the Hurley (stick) and Tux (has a hole for stuffing), and best of all are guaranteed against chewing damage. There’s no toy or chew that’s invincible though, so if you have a dog that can get a piece off, you can bring it straight back to the store and we’ll swap it out for something else. Best of all, we mail the pieces back to them and they melt them down and make new toys. Note: we carry several brands of guaranteed toys. People sometimes seem intimidated by brushing a dog’s teeth, or think that it’s a little silly. Dental health is so important though, and if you’ve done a good job maintaining healthy teeth and gums, your dog’s life could be extended. Gum disease can cause bacteria to enter the bloodstream, causing damage to organs. Brushing is a good way to help keep plaque at bay, and can save you big money at the vet as a result. Remember, visiting the vet for preventative care including occasional dentals to check for damage and clean below the gum line are important, but if the dog’s nutrition is solid (poor nutrition can result in weaker teeth), they are chewing a lot, and their teeth are getting brushed, you can avoid a lot of extractions and the expense of frequent surgical cleanings and treatments. And it’s not that hard! Luckily doggie toothpaste is yummy and makes the job easier. * A puppy’s mouth is changing rapidly and vigorous brushing is not recommended, but now is the time to get them used to the routine and getting them used to you investigating their mouths and touching and rubbing their teeth and gums. First, get them used to you opening and looking at their whole mouth. This will be very valuable to you later in life, where noticing changes in the color of the gums, or noticing a new spot that has developed could be the key to catching a developing condition. Perhaps each night when you brush your teeth, you call the puppy in for an inspection of the mouth and then reward them with a little treat. This will help you to set up a routine with them for brushing later. * To get them used to brushing, start with letting them have a lick of the toothpaste. They come in yummy flavors like chicken, peanut butter, and vanilla to help you make the experience positive for them. (It’s important not to use human toothpastes, as those are designed not to be swallowed). Once they’re loving the taste, you can simply rub your finger with toothpaste over their gum line on the outside (most plaque builds up in the back on the outsides of teeth). Once they’re OK with this, wrap a piece of gauze around your finger and rub the teeth along the gum line – even this will help to remove food particles and starches that adhere to the teeth. As the dog gets older you can move on to finger toothbrushes and then when adult teeth are in place, a doggie toothbrush will do the best job. When choosing soft toys for a brand new puppy, toys without fluffy stuffing are safer, but remember all kinds of material can be shredded and ingested. Ropes can be stringy, rubber can be chewed into pieces, leather seems like an edible chew to a dog, etc. So, always supervise when any new toy is introduced and remove toys if you’re worried about pieces being ingested. It’s a good practice to rotate your toys to keep them exciting. Put away some toys and in a few weeks swap them for things that are laying around that aren’t fun anymore – the novelty may be helpful to save you money. When shopping the first time for a very young puppy, something soft and rubbery like the Planet Dog Lil’ Pup Bones or other Orbee toys work well, as well as something fun and plush like a braided fleece tug. * Find a really high value treat (like a soft jerky that can be torn into small pieces) and keep it by the door so you can grab it on the way out. Bring them out on a leash to the same spot in the yard (this spot can be a scent cue for them for future potties). Praise them calmly as they potty. As soon as they finish, give them a treat and a party! Rewarding right away ensures that they know that it’s the potty that is being rewarded. If they’re far away and you are calling them to you when they’re done with potty and then giving them a treat, they will associate it with the recall and not necessarily with the potty. Recalls are great things to reward, but immediately rewarding the potty when they finish will be important to getting faster results. Get them out frequently in the early days, but do figure out a few regular times in the day that they can count on being able to get out. If there’s a schedule they can rely on, this may help them to start to learn to hold it and be able to “cash in” on the potty outdoors for that treat, instead of letting it go in the house and getting nothing. * If you see them start to potty in the house, try to interrupt it quickly and get them outside. If they finish outside, they get the same treat and party that they would have gotten if they’d done it right. If they don’t finish outside, keep them with you if you go back inside, and try them again in a moment. When they eventually get it right, give them the treat and party! You want them to know that potty doesn’t make you mad, it’s the location they have to get right. Punishing an accident inside may make them wary of going potty in front of you and feel it’s safer to sneak off and potty out of your view. * If you find an accident and never saw the dog doing it, there’s nothing to be done but clean it up. Punishing them or “showing them” the potty after the fact will be meaningless to them – just like getting angry at a human infant that has smeared spaghetti in her hair – showing it to her and being angry will likely make her cry, but not because she understands that it was a consequence of her previous actions. In the same way, a dog can look “guilty” but might just be responding to your anger and not understanding the cause. Better to interrupt and redirect the behavior, rewarding when they get it right and they’ll want to do it right again! *It may be helpful to keep your water and food bowls on the counter during potty training. You can offer them as often as you like, but if you know just when something went in, you can predict that they’ll need to get out soon after. * When you need to leave the house, the puppy can be left in the crate for short periods (they can only physically hold it for so long when they’re young) or in a puppy-safe area without carpeting (perhaps with an open crate with their bed in it). *Set them up for success: When you’re home, try to keep them in a puppy-safe area when you can’t watch them (a crate or a room like the kitchen with a baby gate) and when you can watch them, keep them with you in the same room. The fewer times they make mistakes when you’re not watching, the faster you’ll have a potty trained dog! Have fun with your new puppy!! Please ask questions if you have them – we’re here to help! Sign up for our newsletter on the “Contact Us” page for news of events & Secret Sales (just for our newsletter list), check out our blog for more articles, and “Like” us on Facebook for neighborhood news and other fun stuff! This is really an informative and helpful information for newbie pet owners. Even the not so new owners can benefit from it. Thanks for sharing!